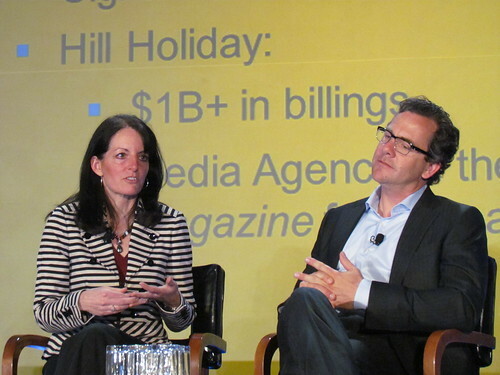 Today at BIA/Kelsey’s Leading in Local conference, Hill Holiday EVP and Chief Media Officer Cindy Stockwell gave a street-level view of the opportunities and challenges confronting brands as they seek to localize their advertising/marketing. While there are voluminous channel and platform choices, Stockwell stressed three universal precepts: “add value to consumers in whatever channel they use,” “drive choice,” and “provoke conversation” (thus sparking virality). Stockwell has led campaigns for prominent brands, notably Dunkin Donuts, across a variety of channels, utilizing various creative approaches. Dunkin, for instance, has run everything from branded messaging within social games to mobile-local coupons/locators in markets based on store density. The bottom line: national marketers enjoy more choices than ever, and that increasingly includes customizing messaging to specific customers.